Heyyyyy friends! Me again! 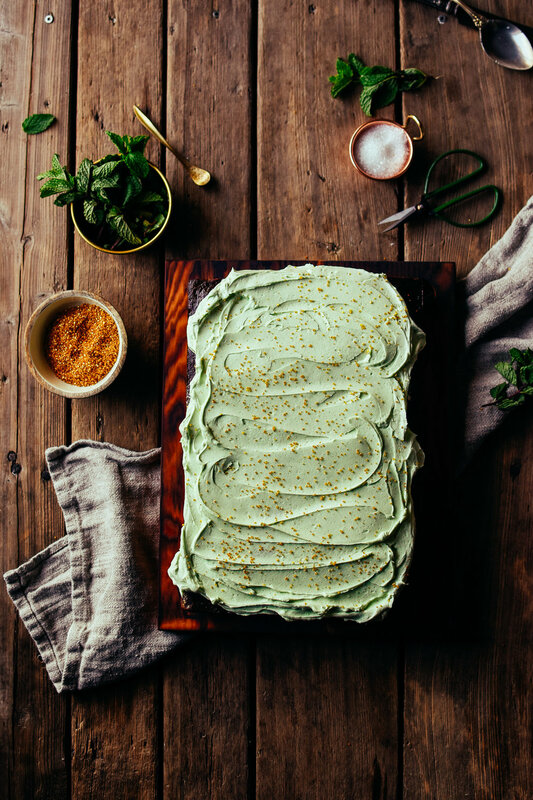 I decided to do a little subtle St. Patrick's day recipe for you. 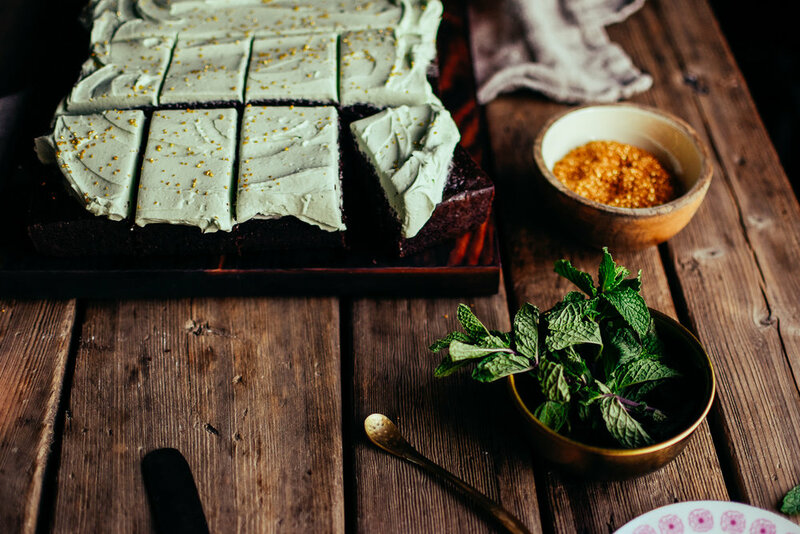 I did an easy peasy chocolate sheet cake for ya (these things are seriously my fave thing ever), topped with a subtle mint frosting. Let's talk about mint. Some people love it, some people hate it. There's such a fine line between refreshingly herby mint, and toothpaste. Am I right? I think I got this just right, and kept the mint from being too overwhelming. This was my first time trying to use fresh mint instead of extract, and it is SO WORTH IT. This is much more spearminty, and doesn't taste fake....duh. Totally worth the extra effort of finding fresh mint (grow your own, it's the best! ), and muddling it for this recipe. So I muddled the mint, blended it with some very soft/melty butter and a couple tablespoons of milk to get it nice and smooth (although flecks of mint in the icing would be totally cool too), and then mixed it in with the rest of the butter, icing sugar, and a dash of vanilla extract. Heaven, I tell ya. I smoothed it over top of my go-to one bowl chocolate sheet cake, and it makes for such a quick and easy recipe that is so easy to serve to a large group. First muddle the mint leaves. This work best in a mortar and pestle, or use the back of a spoon and be sure to crush and bruise the leaves to release the flavours, don't just finely chop them. In a small blender, mix together mint leaves, cream, and 1/4 very very soft butter. You want their to be enough liquid for it to blend smoothly. Mix until just smooth. In a large bowl, mix together the remaining 3/4 cup of butter, vanilla, and icing sugar. Add in mint mixture, and beat on medium low for 3-4 minutes. The frosting should be very smooth and light. 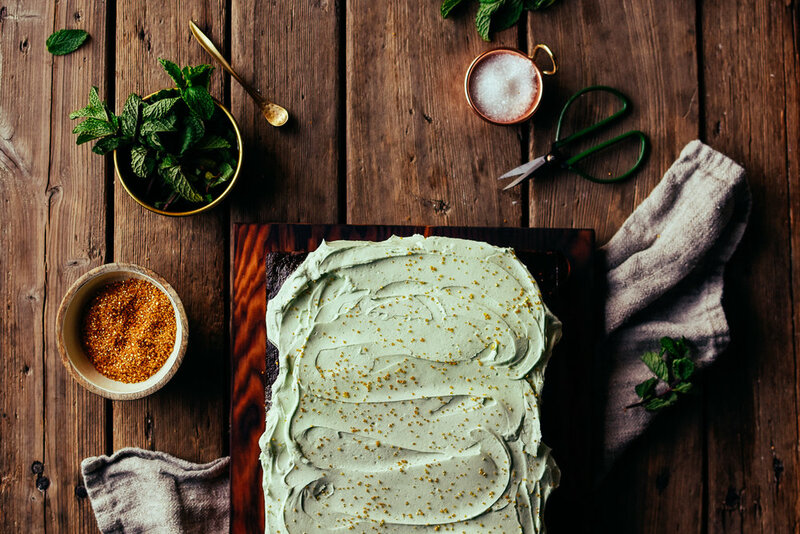 Don't beat on high or you'll form air bubbles; if this happens, beat on low for a couple minutes, or use a spatula to run lines through the frosting to pop any air bubbles. Note: The frosting will be a natural beige/green colour, so I added the smallest amount of green food colour gel to bring it to a sublte pale green. This is optional of course, but this icing isn't naturally green. *If your vanilla is not clear like mine was, then it will be a darker beige. Spread evenly on cooled cake, or store in an airtight container in the fridge until ready to use. This frosting also freezes well. Defrost in the fridge the day before you want to use it. Mix on low speed to smooth frosting if needed.